The EF50 was by no means a version of the EE50. Although both were HF pentodes originally developed in the late 1930s for the then-emerging application of broadcast television, the EF50 was of conventional type, whereas the EE50 achieved at least part of its amplification by deliberate secondary emission (the same principle as employed by photomultiplier's, where an energetic electron hitting a metal surface can dislodge a "shower" of further electrons). 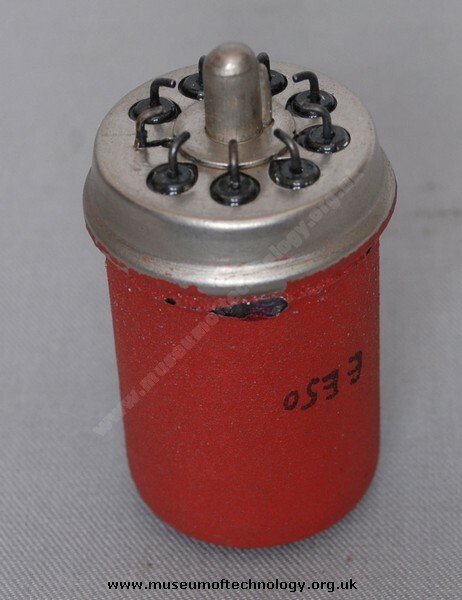 In effect the two pentodes operated in diametrically opposite ways, the conventional EF50 using electrode #3 to suppress secondary emission from the anode, the unconventional EE50 using electrode #3 to stimulate secondary emission towards the anode. Fascinating to see one of these EE50 valves. It should be added that the version that did go into production was the EF50 valve, of which much could be written. This valve was critical to the British WWII radar development, because it produced less noise at the high frequencies (in 1939/40) used by that type of equipment. It is said that the EF50 had to be prised out of the hands of Philips, its manufacturer, since the valve was destined purely for domestic (i.e. Dutch) use. Apparently they only agreed to supply it to the UK following a formal request by the UK government to the Dutch government.